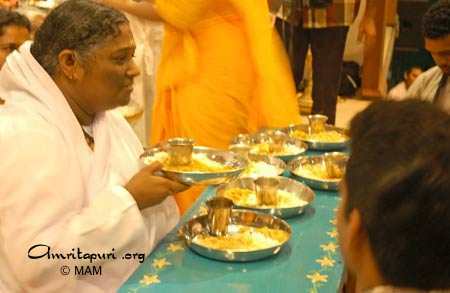 After touching down at Sea-Tac International Airport, Amma went to a devotees’ house located just to the north of Seattle. 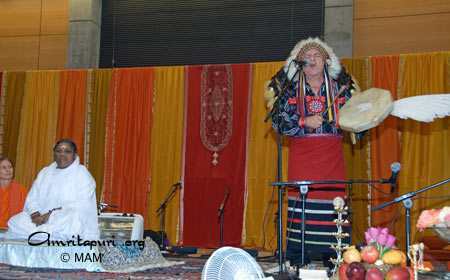 As has become customary, a number of devotees had gathered there to welcome Amma to the U.S for this, her 21st annual tour of the country. 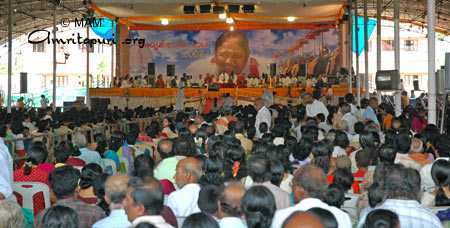 Amma quickly made her way to the centre of the devotees, inquiring about their well-being and all the latest developments in their lives. 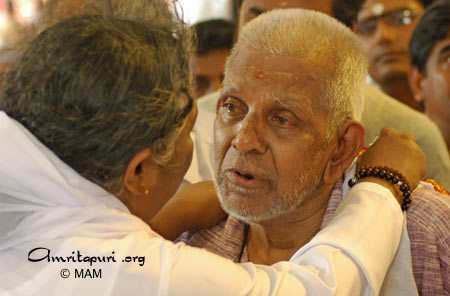 A few weeks before Amma’s arrival, an American devotee who had been very close to Amma since meeting her during her first U.S. Tour in 1987 had passed away due to illness. 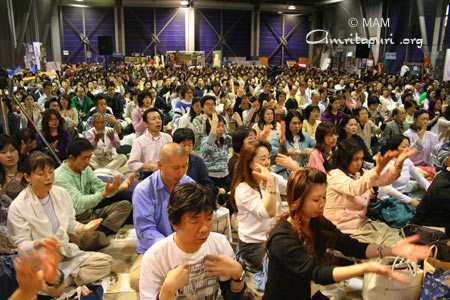 The lack of his presence in the gathering was felt by everyone. After sitting on a chair in front of all the devotees, Amma asked everyone to take a moment of silence and to pray for his well-being. 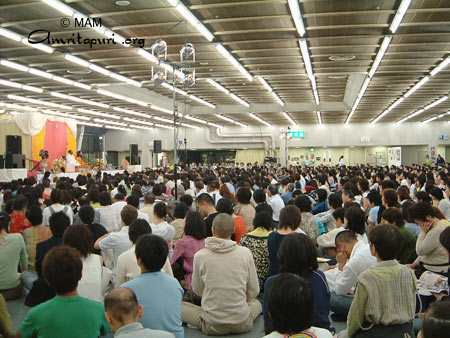 She also asked everyone present to think of all the devotees who could not be there, for whatever reason. 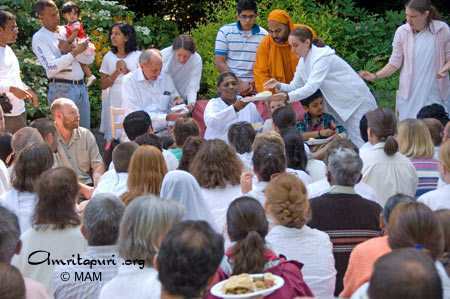 A meal had been prepared, and Amma soon began to pass out plates of food to everyone as prasad. As she did so, Amma’s gaze scanned the crowd, continuing to take in the faces of her children, many of whom she hadn’t seen for the better part of a year. 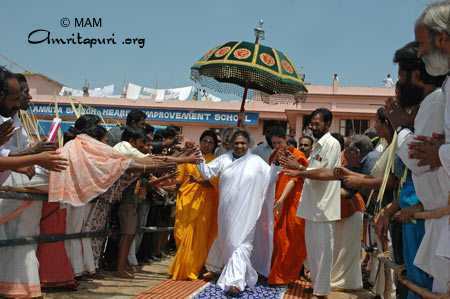 At this point, a girl standing near Amma noticed that Amma was wearing a jade ring on her right hand. 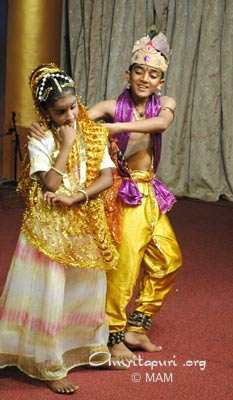 As it is not Amma’s habit to wear such jewelry, the girl asked Amma why she was wearing the ring. 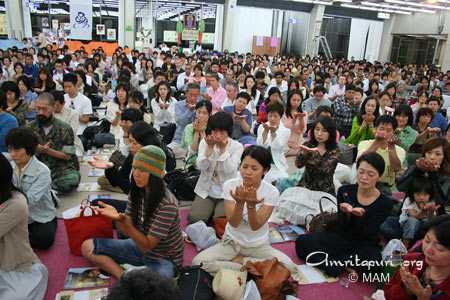 Amma said that during the final program in Japan, a devotee had given her the ring, and that due to the deep love with which she had given the ring, Amma had felt drawn to put it on and to continue to wear it for some time. 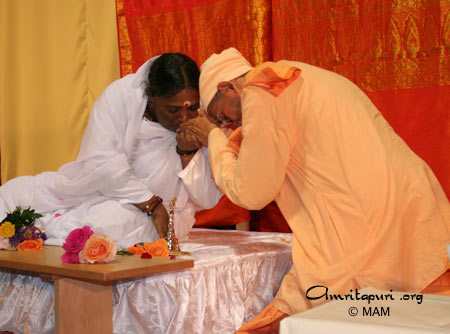 Amma then said that, in fact, the face of the girl who’d given her the ring had reminded her of the wife of the devotee who’d recently passed away. 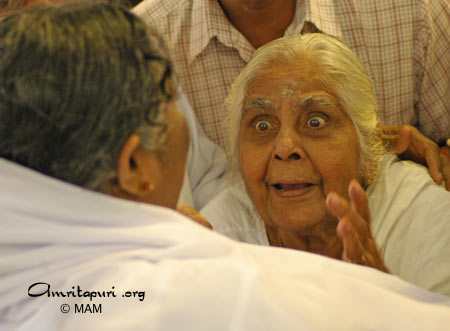 Amma explained that for her it is often like this. Wherever she goes, the faces of the people to whom she gives darshan remind her of the faces of other devotees—often ones living on the other side of the world. Faces in India remind of her of ones in America. 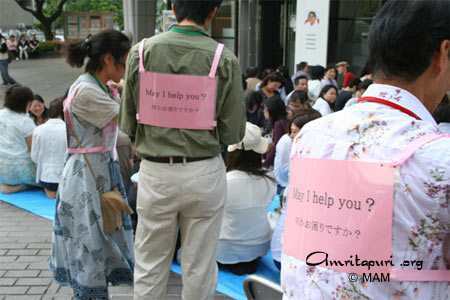 Faces in Japan remind her ones in Australia. Faces in Europe, of those in India…. 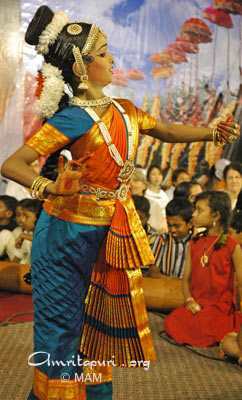 Voices too, Amma said; the way a certain person speaks often will make her think of someone else in a country far, far away. 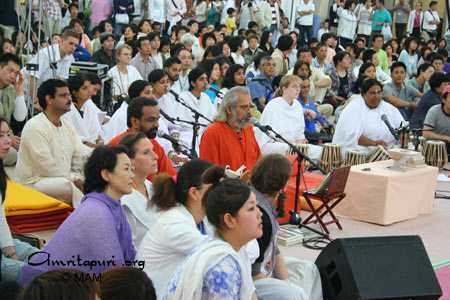 In this way, Amma said that she is always thinking about her children all around the world—even if they are not able to be physically with her. 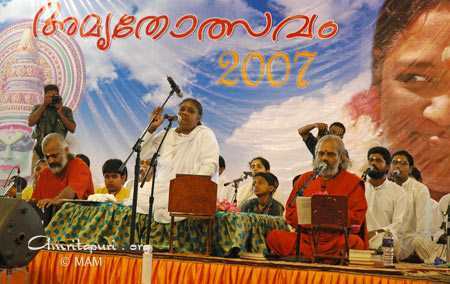 Watching Amma gaze into the faces of her American children, one had to wonder what thoughts and memories were running through her mind. Which devoted souls was she recollecting? And from where? 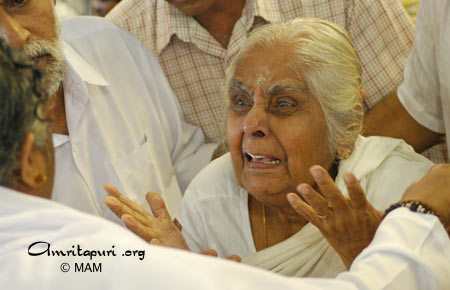 And were they thinking of Amma as well, seeing her in the people before them? 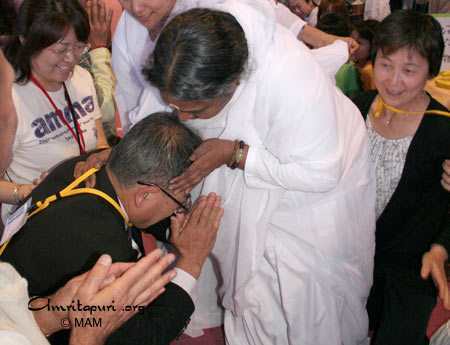 Amma left Amitapuri this morning for programmes in Japan, US, Canada and South America. 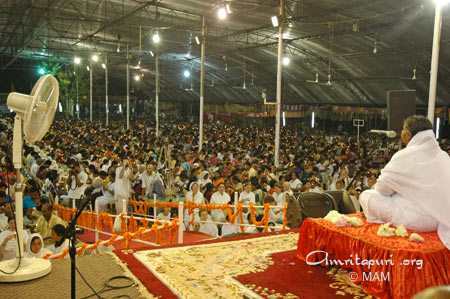 Amma will be back in Amritapuri only in the month of August. 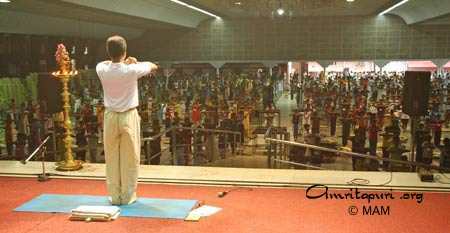 A three day IAM Meditation camp for a new batch of instructors, started at Amritapuri today. On Friday, Amma held a second question-and-answer session with the children participating in the Amritam ’07 Personality Development Camp. 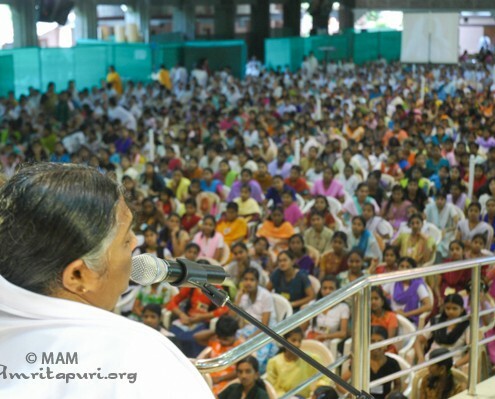 Before Amma began answering the children’s questions, she told them all that she expects to see some change in them after their completion of the five-day camp. 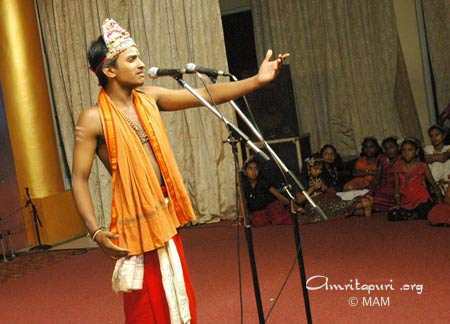 Amma then told the children a story about Yudhishthira from the Mahabharata, wherein the young prince shows how he did not learn his lessons mechanically, but imbibed them and put them into practice as well. 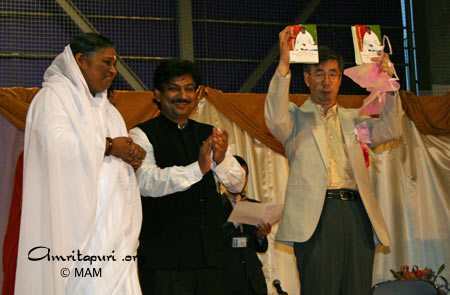 Amma also talked about how actions are made positive or negative by the motivation behind them. “With a pen, you can write beautiful poetry or abuse someone. 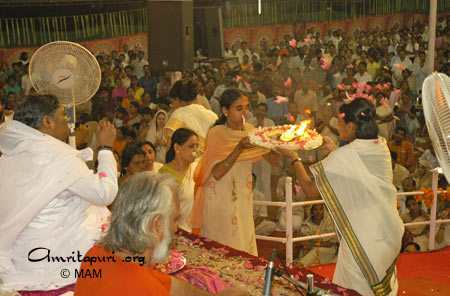 With fire, you can burn down a house or cook food,” Amma said. 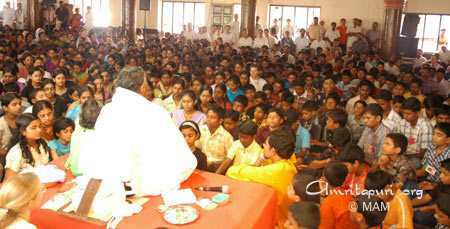 Amma then explained to the children how, for success in life, three factors need to come into alignment: proper effort, proper time and grace. “You are healthy today, but you may fall sick tomorrow. So study well now. 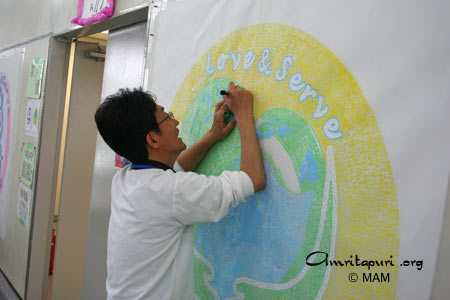 Try to do as many good things as possible. 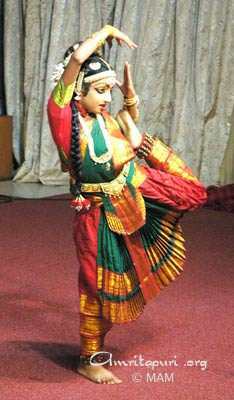 Try to learn to laugh at your own foolishness,” Amma said. 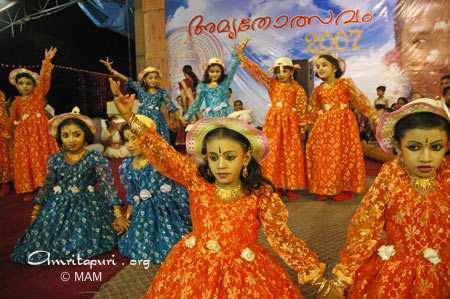 Amma ended by explaining to the children how important it is to cultivate good values, saying how without values even if we are skillful, no one will look up to us or respect us. She cited as examples Mike Tyson, the former heavyweight boxing champion who disgraced himself towards the end of his career by biting off the ear of one of his opponents, as well as cricket stars who threw games for money; who loves money more than their mother land. 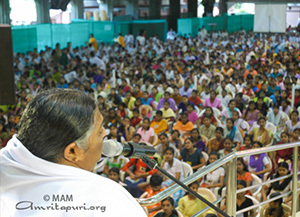 “Mistakes may happen, but you should repent and resolve not to repeat them,” Amma said. Once again, the children demonstrated their precocity and thirst for knowledge, posing questions on topics from the annihilation of the ego to burning social issues. 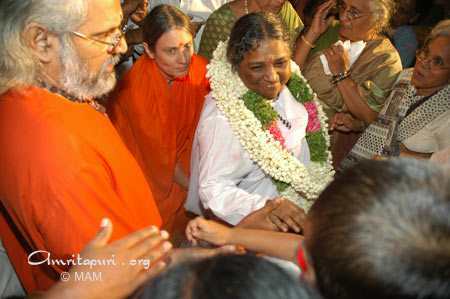 Some questions included: “Why are Hindus allowed in churches but non-Hindus not allowed in certain temples?”; “What is life: reality or maya?”; “How can we transcend the ego.”; “I don’t want to know what I did in past life; I want to know what I should do in this life.”; “Why does Amma touch the broomadhya [point between the eyebrows] to some people when she gives them darshan?”; “Amma, the whole world worships You? 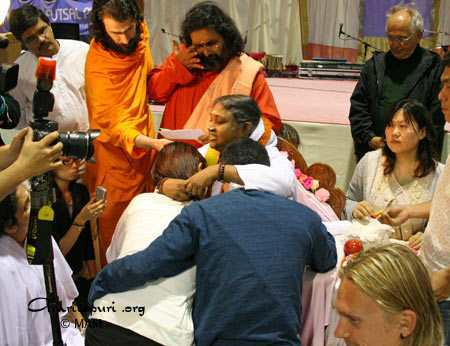 How does this make you feel?”And one girl asked Amma to say something to both the boys and the girls regarding India’s child-trafficking problem. 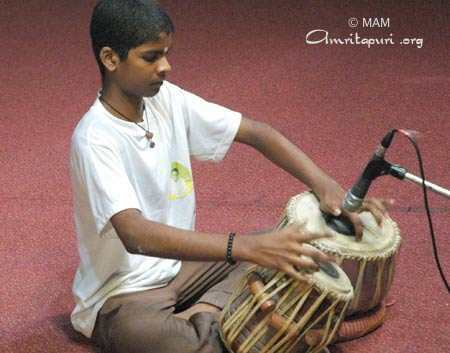 The session ended with a request by the children for Amma to sing the bhajan “Mata Rani.” Amma acquiesced and soon the entire bhajan hall was clapping hands and dancing to Amma’s song. 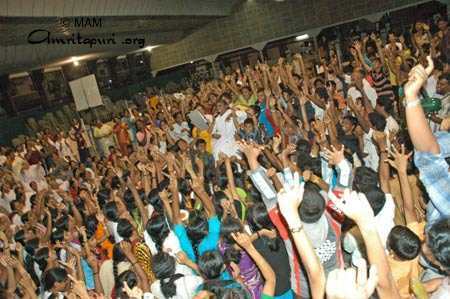 Amma will be giving darshan on Saturday and Sunday (May 12th & 13th). 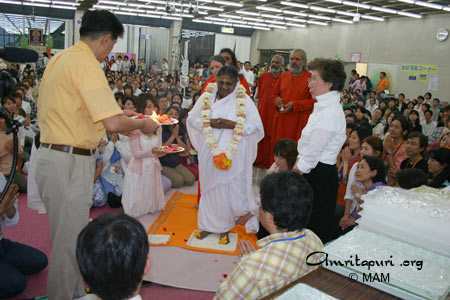 This will be the last darshan in Amritapuri before Amma leaves for her tour of Japan, United States and South America. 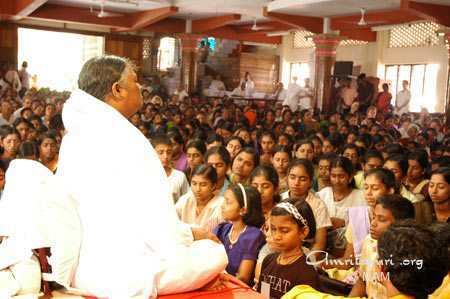 The next darshan in Amritapuri will be in early August. 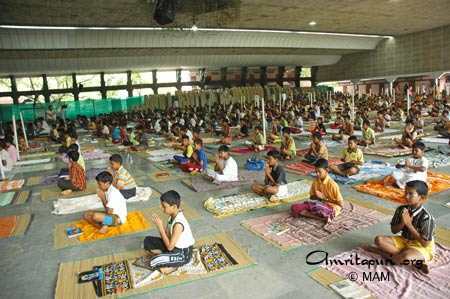 “What is the meaning of ‘Om’?”, “Why must devotees of God still face sorrow?”, “Was the tsunami a punishment sent by God?”, “Amma, when you were a little girl and your parents beat you, what were your thoughts?” These were some of the questions put forth to Amma by the 2,500 children currently attending the Amritam 2007 Personality Development Camp, taking place in Amritapuri from May 7th – 12th. 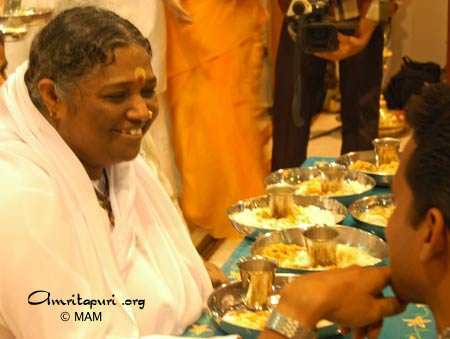 “For now, you should study,” Amma said, implying that the knowledge they accumulate now would help them attain serve the world more effectively in the future. 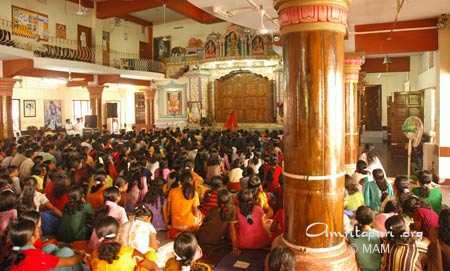 Amma then told the children that if they were able to make such changes in their lives that it would similarly influence their classmates. 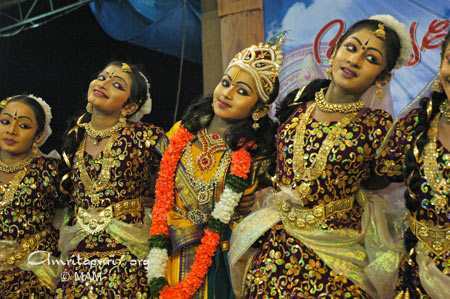 Amma said that if such awareness and compassion could be awoken in just 50 children, they could easily come together to sponsor the educations of two poor children with the money they saved. After her question-and-answer session with the children, Amma gave served them all lunch as prasad. 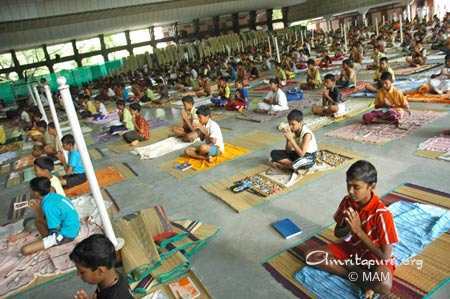 Other activities scheduled for the children during the five-day-long camp include yoga classes, IAM Meditation classes, acting classes, music and drawing classes, the telling of Puranic stories and talks by Amma’s swamis. 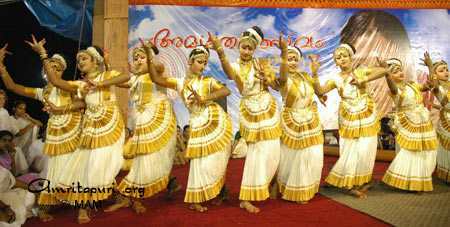 At Mata Amritanandamayi Devi’s Brahmasthanam Festival in Trissur, the new Amrita Nilayam Working Women’s Hostel was inaugurated by the city’s mayor, Professor R. Bindu. The aim of the hostel is to provide safe living quarters for women working in the city of Trissur. 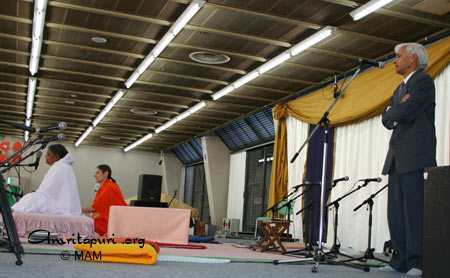 In her speech, Professor Bindu thanked the Mata Amritanandamayi Math for building the hostel. 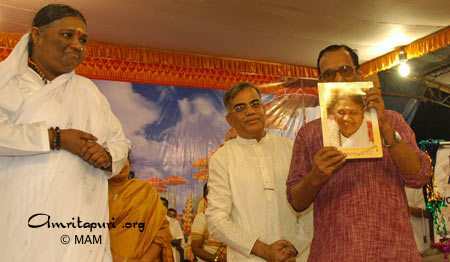 “There is no doubt about it,” she said, “Amma is using all the financial and intellectual resources of her organization for the welfare of society. 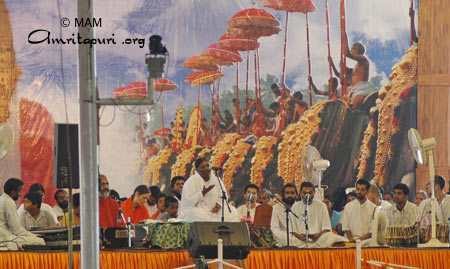 Amma’s two days in Trissur culminated in a massive downpour—both of water and of devotion. 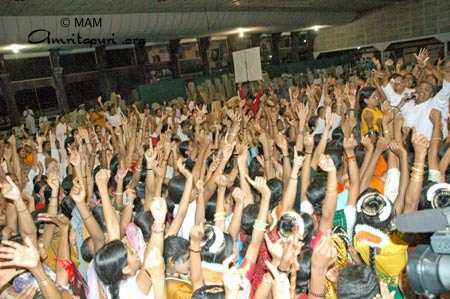 As the monsoon rains ushered forth, Amma and the devotees sang “Mata Rani,” opening the floodgates of their hearts. 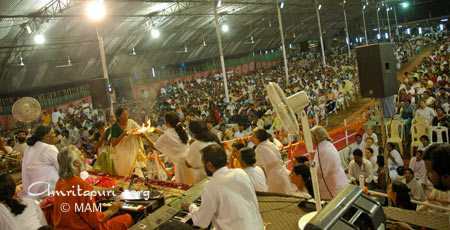 Amma reached Trissur this evening after the Brahmasthanam Festival in Palakkad. 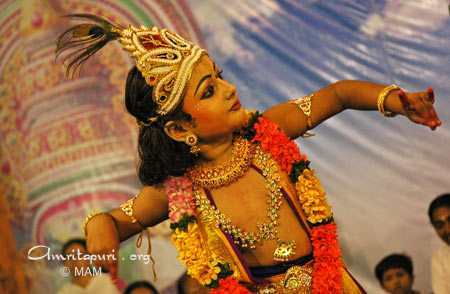 Amma will be here in Trissur for the next two days, participating in the Brahmasthanam Festival. 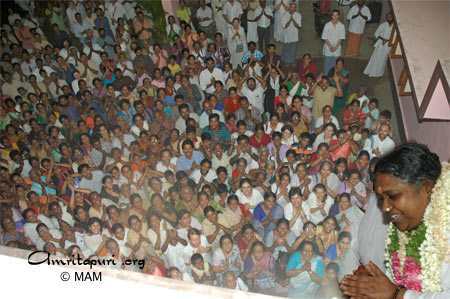 When Amma arrived at Trissur in the evening 3 May 2007, Trissur, Kerala. 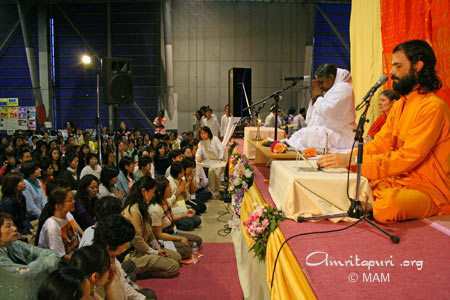 Welcoming Amma, Devotees singing "Amma Amma Taye". 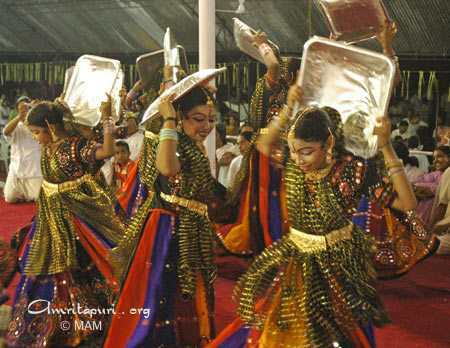 Amma clapping along with them from her balcony. 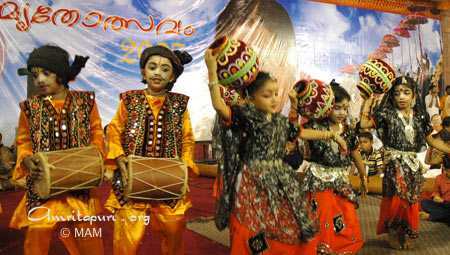 3 May 2007, Trissur, Kerala.